Perhaps more than any other department in your company, sales people spend as much time on the road as they do in the office. To stay productive, they need access to data, transactions, and customer information wherever they are. That’s why Sage CRM 7.3 continues to add functional improvements to the mobile CRM component. Before we examine mobile features in Sage CRM, it makes sense to point out that the ability to access CRM on a mobile device is about more than just flashy features or gee whiz technology. There’s real business benefit in making sure that CRM is easy to access and use. By improving convenience and access, you also improve user adoption which is critically important to a successful CRM strategy. It’s not uncommon for sales people to continue “doing things the old way” because the new CRM software is hard to use or requires them to be in the office to update the system. Simply put, your employees will actually use mobile CRM and not view it as an unnecessary administrative burden that ties them to their desk. Sage CRM 7.3 consolidated styles into a single mobile theme that looks and works the same way on an iPhone, Android, or tablet so you get a consistent experience across devices. The enhanced mobile theme also features a new user interface with a cleaner layout, rearranged slide-out menus on every page, and the new “flat” design that has been made popular on newer mobile operating systems. You can track customer and prospect communications, schedule appointments or follow up tasks, update customer records, manage meetings, and so much more - all while you’re on the go. You can also import Android or iPhone contacts as a new lead or “Person” in Sage CRM without fumbling around with data files or exports. Work offline and still access customers, contacts, and opportunities when out of coverage area. Integration with maps to navigate sales appointments. Customize screen colors to identify different types of records at a glance. Add custom fields to Person or Opportunity records. New calendar rearranged in a journal view making it easier to scan your schedule. Import phone contacts as new Sage CRM Person. 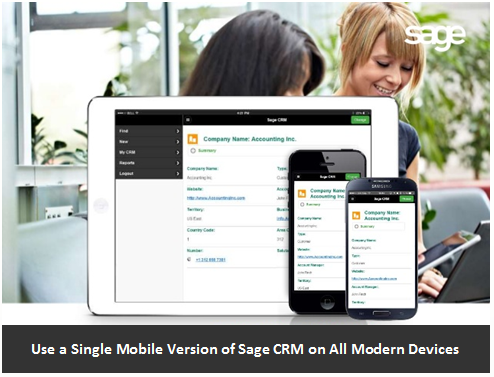 Download the Sage CRM 7.3 Mobile Guide for full details about how to set up and work with the Sage CRM Mobile components. Or Contact Us if you need help.